People across the globe are of two minds about globalization: in principle, most believe it’s good for their country; in practice many – especially those in advanced economies – are not so sure it’s good for them personally. This skepticism, especially among Americans, Japanese and some Europeans, poses serious domestic political challenges for the transatlantic and the transpacific trade deals now under negotiation, according to a new Pew Research Center survey of publics in 44 countries conducted this spring. 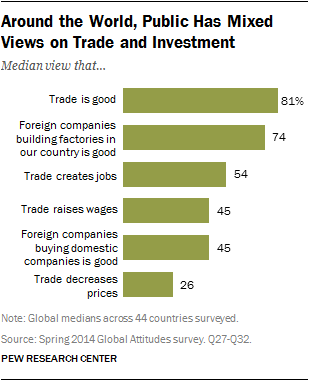 The good news for advocates of globalization is that people across a diverse range of advanced, emerging and developing economies overwhelmingly (a median of 81%) say that international trade and global business ties are good for their country. People also generally voice the opinion (a median of 74%) that it is beneficial for their economy when foreign companies build new factories in their country. The survey included 48,643 respondents from March 17 to June 5, 2014. The bad news for these same apostles of globalization is that a significant share of people in many nations have reservations about the impact of deeper international economic integration. Just over half (54%) believe trade creates jobs. Only a plurality (45%) holds the view that it increases wages. And barely a quarter (26%) share the opinion that trade lowers prices, contrary to one of economists’ principal arguments for why nations should trade. The ugly political consequence of such sentiment is that skepticism about trade and investment is particularly strong in France, Italy, Japan and the United States. Each of these nations is involved in negotiating major regional trade agreements: the Trans-Pacific Partnership (TPP) in the case of the U.S. and Japan and the Transatlantic Trade and Investment Partnership (TTIP) between the European Union nations and the U.S. If approved, the governments involved, including the Obama administration and most of the business communities in Europe, Japan, the U.S. and other countries party to the talks, say the deals will spur growth and jobs while benefiting consumers. But, when we ask about specific implications related to international trade, the American public is particularly skeptical. For example, barely 17% of Americans think trade leads to higher wages, only 20% believe it creates new jobs and just 28% say foreign companies buying American companies is good for the country. This undercurrent of distrust could complicate government efforts to further deepen and broaden global markets.